I love the delicate patterns of the ferns growing along the roads and woods around my New Hampshire home. Using a photographic process, I transferred the image of one of these, bracken, onto a silk screen. 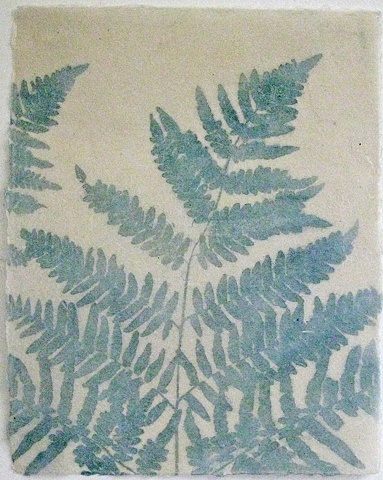 I sprayed green-pigmented cotton pulp through this bracken-patterned silk screen onto a wet base sheet of kozo paper to form the fern image. This piece is part of a series of approximately two dozen 11" x 14" fern papers (in shades of green) that may be used as prints, background for other prints, or by book artists. Please contact me for additional information.